I learned about this book through my book cover designer (Tugboat Design) and decided to buy it and give it a try. Am I glad I did. This novel by Jan Romes was fun to read and would make the perfect vacation or beach read. And it's only $1.99 on Amazon! Here is a description of the book and my 5 Star review! Jessi Novac is a romance author whose life is recently in turmoil. She is being stalked, so she decides to hide out in her grandmother's Myrtle Beach home until the police can find out who is following her. She needs peace and quiet to finish writing her latest novel on time, but instead is sidetracked by the handsome handyman next door. Her life becomes a succession of adventures and misadventures as she realizes she's still being followed and as she also finds she is falling in love with her handyman hero. 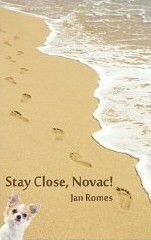 Stay Close, Novac! is a fun, witty and face-paced romance novel. The author, Jan Romes, writes in a way that reminds me of Janet Evanovich with her charm and wit. Even though this is a short novel, the story is quite full and you walk away feeling like you have read a book twice its size. I really enjoyed reading Stay Close, Novac! and will definitely read more of Ms. Romes novels. I am currently reading Yellow Crocus by Laila Ibrahim. I have hardly been able to put it down - it has been that good! I'll write a review when I'm done! You're welcome, Jan. It's a great book! Thanks for the recommendation, Deanna. I just previewed the first few paragraphs with Amazon's Look Inside feature and bought the book. I've read several books recently that range from mediocre to awful so this will be a welcome change! Hi Crystal - I think you will enjoy this book - it's a fun read - and the price is right! Outlaw Heroes Now Available in Paperback!